One of my fave products? 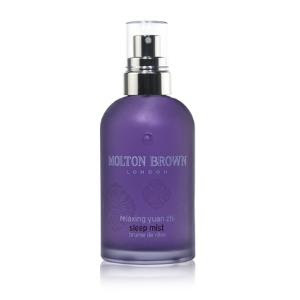 Definitely Molton Brown Relaxing Yuan Zhi Sleep Mist. Every time I use it, I'm out for the count within 15 minutes. And now one lucky reader has the chance to win a full-sized bottle of this miraculous mist, valued at $38! Entering is easy. Simply enter your name and email address in the box below. The winner will be selected on Friday, November 6 and notified by email. It's that simple! This giveaway is open to US residents only. Giveaway runs until Thursday, November 5 at midnight. One entry per person, email address and IP address. Multiple entries will be disqualified. I did not know there was such a product. I would love to try it. This would help me sleep well, thanks for the contest.